Over the course of the Spending Review period, the Department of Energy and Climate Change will reduce resource spending by 18% in real terms, and increase capital spending by 41% in real terms. The Department’s Administration budget will be reduced by 33%. DECC’s settlement is in the context of an increase in environment spending across Government by 21%. The Spending Review ensures that the UK can meet its environmental goals, including the 2020 targets for a 34% reduction in greenhouse gas emissions and for 15% of energy to be from renewable sources, while improving efficiency, supporting growth and facilitating a private sector led transition to a green economy. Up to £1 billion of investment to create one of the world’s first commercial-scale carbon capture and storage demonstration plants - strengthening the UK’s position as a world leader in cleaner fossil fuel technology. 200 million for low-carbon technologies including offshore wind technology and manufacturing infrastructure at port sites. DECC will fund a smaller, targeted Warm Front programme for the next two years with a budget of £110 million in 11/12 and £100 million in 12/13. From 2013, support for heating and insulation for the most vulnerable will be delivered through the Green Deal for energy efficiency and a new obligation on energy companies. At the same time, from April 2011, energy suppliers will provide greater help with the financial costs of energy bills to more of the most vulnerable fuel poor households, through Social Price Support - with total support of £250 million in 11/12 rising to £310 million in 14/15. To ensure the available resources are focused most effectively in tackling the problems underlying fuel poverty, the Government intends to initiate an independent review of the fuel poverty target and definition before the end of the year. • Revenue raised from the Carbon Reduction Commitment (CRC) Energy Efficiency Scheme will be used to support the public finances (including spending on the environment), rather than recycled to participants. The Nuclear Decommissioning Authority (NDA) will continue to improve efficiency in order to increase investment in decommissioning the highest hazards across its estate. Capital funding for the NDA will increase over the Spending Review Period. The Government will review the work delivered at arm’s length by bodies such as the Carbon Trust, Energy Saving Trust, the Coal Authority and the delivery arm of Ofgem. DECC will also make savings in its programme spend, including not providing Government funding for the National Nuclear Centre of Excellence, and refocusing contributions to international institutions. Administration costs will be reduced by 33% through increased use of shared services across Government, a refocusing on critical workstreams and further reductions to travel, accommodation and IT expenditure. 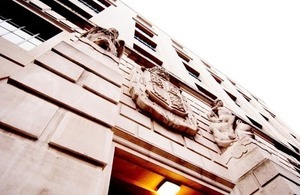 DECC will issue guidance to re-emphasise best practice on heating, cooling and lighting Government buildings. This guidance will encourage departments to reduce waste on energy costs, helping to reduce the Government’s £95 million annual energy bill, whilst saving carbon emissions at the same time. Environment spending defined as DECC RDEL & CDEL excluding spending on energy legacy (Nuclear Decommissioning Authority, British Energy liabilities, Coal Authority and Concessionary Fuel programme), DECC AME spend on the Renewable Heat Incentive, Defra RDEL & CDEL, spending via Renewables Obligation and Feed-in Tariffs.